This week has been insane for our family. Last Saturday, my husband’s mentor, friend, and supervisor, Lenny, died after a brief battle with cancer. Sunday night, I got the call that my grandmother had died. Lenny’s funeral was an hour-and-a-half away on Tuesday, and Grandmother’s was 3 hours away today. I feel like I’ve spent most of the week on the interstate. Naps were missed, the emotional energy was high, we didn’t sleep great. We’re completely wiped out by this point and savoring the idea of a weekend of rest. As we came home from Lenny’s funeral Tuesday night, this amazing vertical rainbow appeared in the sky. We were awed, as we’d never seen a vertical rainbow before. Taking a look in the rear view mirror revealed a gorgeous sunset (sorry, no picture of that). It felt like God was hugging us. Then, this evening we were returning home from my Grandmother’s memorial service. I was driving, and I was tired. Traffic for the first 25 miles had been hellacious, with normal Friday-summer-afternoon-eastbound-traffic meeting the Construction Zone from Hell for 8.5 miles. I was sustaining on a frappe and determination, watching cars, attending to the light traffic and the road, enjoying my Jim Brickman play list. My eyes rose to the sky ahead, and there right in front of me was a rainbow. I pointed it out to my family so they could enjoy it, too. It was faint, but there, and we eventually were able to make out the other end of it. Around this time, I took a peek at my phone to see which selection was playing. It was “Sacred Moment,” and I recognized the tune as “O Sacred Head, Now Wounded.” Wow. Just… Wow. The rainbow. That symbol of God’s promise never again to destroy the world by flood. And God has kept this promise. If God keeps this promise, would not God also keep the other promises he’s given us? My cousin Mark read the words of Jesus from John 14 today: “I go to prepare a place for you.” I looked at that rainbow and listened to that tune and thought, This is God’s promise, fulfilled for us in the death, resurrection, and ascension of Jesus Christ. 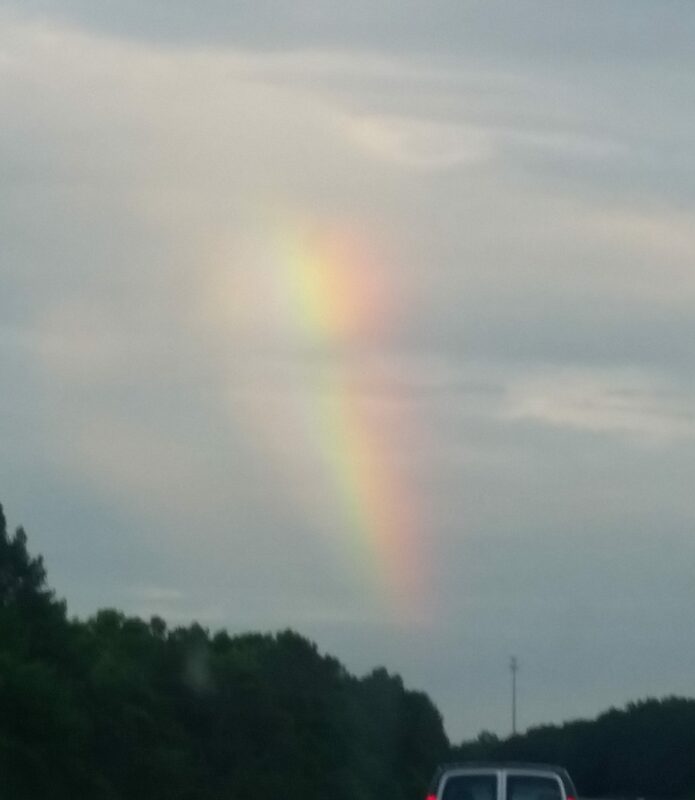 This rainbow served as a reminder that God keeps God’s promises – all of them. I seized the holy teachable moment and took the opportunity to talk to my girls about it. My younger one said, “It’s like the promise for Great-Grandmother.” Yes! Yes, it is. And that promise is for us, too. I haven’t cried for Grandmother. She’d been sick since February and psychologically ready to die for over a year. But I could cry over the magnitude of God’s promises and how they have been fulfilled for her. She’s with Grandpa again, turning 67 years of marriage on Earth into an eternity of marriage in Heaven. This entry was posted in Faith, Family and tagged death, funeral, God, John 14, promises, rainbow. Bookmark the permalink.